Minister of Tourism, Hon. Edmund Bartlett, describes the soon to be introduced Tourism Workers’ Pension Scheme as an act of a Government and people who recognize the value of a set of workers who have been on the wrong end of equity for a long time. Listening intently are (l-r) Jhanelle-Rae Bowie, Economist in the Ministry of Tourism; Camille Needham, Executive Director of the Jamaica Hotel and Tourist Association; and the Hon. Daisy Coke, Chair of the Tourism Workers’ Pensions Oversight Committee. Minister Bartlett was speaking to tourism workers at a Kingston sensitization and awareness session for the pension scheme held yesterday (July 11) at the Knutsford Court Hotel in New Kingston. The pensions scheme covers all workers ages 18-59 years in the tourism sector, whether permanent, contract or self-employed. Benefits will be payable at age 65 or older. Jamaica Minister of Tourism, Hon. Edmund Bartlett, yesterday (July 11) described the Tourism Workers’ Pension Scheme, which will receive $1 billion in funding from the Jamaica Tourism Enhancement Fund (TEF), as the final piece in a four-point human capital development plan to enhance Jamaica’s tourism workers. The defined compensation scheme is designed to cover all workers ages 18-59 years in the Jamaica tourism sector, whether permanent, contract or self-employed. This includes hotel workers as well as persons employed in related industries, such as craft vendors, tour operators, red cap porters, contract carriage operators and workers at attractions. Benefits will be payable at age 65 years or older. The other three initiatives in the human capital development plan are training, capacity building and creating the ability of our people to have knowledge and convert that knowledge into practical applications; providing a pathway to professionalism and jobs; and improving the social conditions around which the Jamaica tourism worker lives. The Hon. Daisy Coke, Chair of the Tourism Workers’ Pensions Oversight Committee, answers questions from participants at the Kingston sensitization and awareness session for the pension scheme held yesterday (July 11) at the Knutsford Court Hotel in New Kingston. The pensions scheme covers all workers ages 18-59 years in the tourism sector, whether permanent, contract or self-employed. Benefits will be payable at age 65 or older. Also pictured are Minister of Tourism, Hon. Edmund Bartlett, and Camille Needham, Executive Director of the Jamaica Hotel and Tourist Association. “The business of tourism with our workers is not just about taking you into the hotels and having you serve in style. 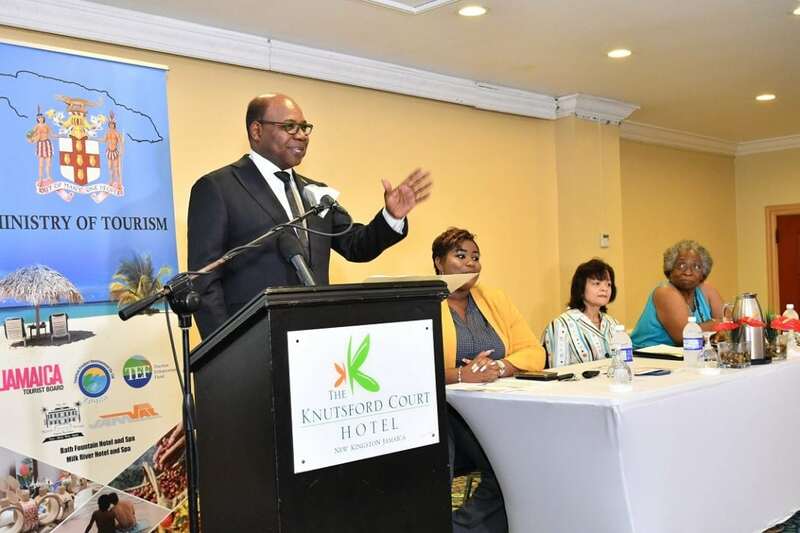 It is about how we include you in the development process,” Minister Bartlett told tourism workers at a Kingston sensitization and awareness session for the Jamaica Tourism Workers’ Pension Scheme at the Knutsford Court Hotel in New Kingston. Minister Bartlett said tourism directly employs some 117,000 workers or 8.8% of the workforce and noted plans to bring 29,000 more workers into the Jamaica tourism industry by 2021. “For that to happen, it means we are going to have to build the capacity of our people to deliver at a higher level of efficiency and to be able also to command the top positions in tourism at every level,” he said. “It is the first time in the history of tourism in our country where within a single year period we are looking at the total human capacity development structure and infrastructure that takes you from high school through university into the field of competence and then straight into professional pathways within the industry,” the Tourism Minister added. Pledging his Ministry’s commitment to improving the social conditions of tourism workers, Minister Bartlett said this year his Ministry would be spending $170 million on housing solutions for tourism workers in resort areas across the island. This project is in partnership with the Housing Authority of Jamaica (HAJ) with funding from the Tourism Enhancement Fund. In addition, the Tourism Ministry will work with the National Housing Trust (NHT) to design a special package to help the workers in the sector access housing solutions being developed by the agency. Minister Bartlett also pointed to work being done to improve the social infrastructure with the communities around the resort areas. “Already this year, I have paved almost all the roads off the Elegant Corridor that lead into where the people live opposite the wonderful hotels. This is the start of a program that will run across the island in all the resort areas and beautification will follow,” said Minister Bartlett. Endorsing the pension scheme, Executive Director of the Jamaica Hotel and Tourist Association (JHTA), Camille Needham, said her organization was extremely pleased that it was now becoming a reality. “You are essential to the sector and go above and beyond the call of duty just to ensure your guests are catered to and they leave the island with a good impression and, more importantly with a desire to return. For these reasons the conclusion must be that you, the workers, take care of tourism and tourism in turn should, in fact must, take care of you,” Mrs. Needham told the tourism workers. The Kingston sensitization session was the final of eight sessions held in major resort areas across the island to provide tourism workers with details of the pension scheme and provide them with information on how they will benefit from the compulsory contributory retirement plan. Other session were held in Ocho Rios, Negril, Montego Bay, Port Antonio, Falmouth, Treasure Beach and Mandeville in the last four months.